A certified sleep apnea physician makes a diagnosis of your Obstructive Sleep Apnea (OSA) by carrying out a home test or in-lab test. A certified physician has the expertise and training in making a diagnosis and curing your sleep apnea. Your sleep physician will require being aware of your symptoms if they started whenever you acquired weight of left working out. You can inquire from your relative, roommate or partner if they know the time you made choking sounds or snored loudly. It may be necessary for you to maintain a sleep diary for at least two weeks. In this diary you will write down the time of your going to sleep every night and the time of your waking up in the morning and the number of times you woke up during your sleep in the night. Your therapist will be able to observe your sleep that may provide him hints in making a diagnosis and correcting your sleep issues. Your certified physician will evaluate you sleep pattern objectively before making a diagnosis. The following testing options are available. You will need an all night stay in a bed at the sleep center in this kind of testing. You will be tested while sleeping and sensors will be hooked up to your various body parts. The function of the sensors is to record your movements and breathing, heartbeat and brain waves. Therapists normally suggest this type of testing in severe cases. This is a costly choice, however, covered by several health related insurances plans. All night in-lab testing offers your therapist full knowledge regarding your sleep. Sufferers who have no other medical conditions but high risk of obstructive sleep apnea (OSA) can be considered for home testing. In this testing you sleep in the convenience of your home and a small sized monitor gathers your sleep data. The home testing equipment is not as much complicated as is utilized during in-lab all night testing. The sleep center representative will demonstrate how you can hook up the equipment by your own. Once your home testing is completed, you can hand over the equipment personally to the sleep center or you can also mail it. 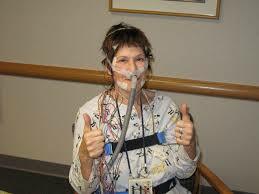 There are several other equipments and applications that claim having the capability of detecting sleep apnea. However, they may produce unreliable results. Therefore, it is imperative that you must talk about these equipments and application with your doctor. Once you home testing or in-lab testing is completed, you will have to set an appointment with your doctor to talk about the results. In case sleep apnea is detected, your therapist will talk about curing choices with you.